"How did you give Wolverine metal claws?" Both Wolverines have excellent sculpts, but crappy plastic claws. Taking advice from a fellow customizer, I decided to give Logan some swanky metal claws. Before you start, you should collect your materials. 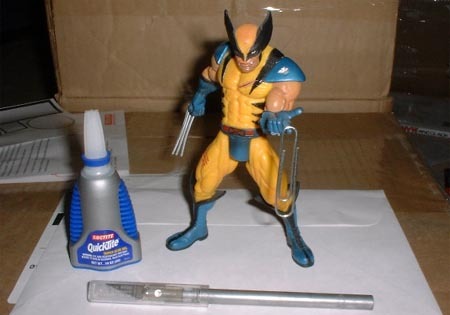 You'll need a Wolverine (duh), a large paperclip, your X-Acto knife and some super glue. We'll be using EoX Wolvie for this demonstration, because I already did the ML version months ago. The first step, obviously, is to cut off the old claws. This is very easy, and hard to screw up. Just pop them off right at the "ports" on the backs of his hands. Be sure to leave the ports, as we'll need them later. Don't worry if you nick his knuckles - the new claws will hide any minor imperfections. It's time to start making the new claws. I use one of those big paper clips, since they're thick enough to look right, and the straight sections are long enough to make decent claws. You'll want to take the claws-to-be from the straight parts, since it's too hard to straighten the bends. Using the old claws as a general guide for length, I snipped the paperclip into sections using my trusty needlenose pliers. 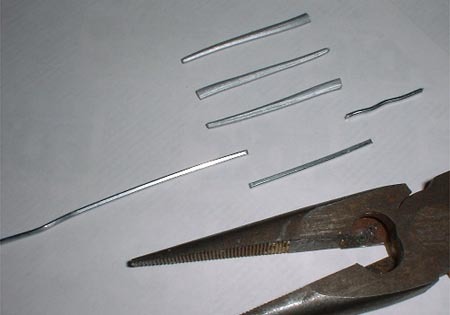 In the picture below, you can see how a section of paperclip compares to the plastic claws. The squiggly bit on the right used to be one of the bent sections. Once you've cut your claws (remember to make the center one slightly longer), it's time to return to the figure. Using your X-Acto (or Dremel, or whatever tool you like), make a small hole in each of the ports. In this picture, two of the ports have been drilled, with one left to go. The holes need to be large enough for the metal claws to slip into, yet small enough to hold them snuggly. To give the claws that authentic comicbook look, you'll have to bend them slightly. 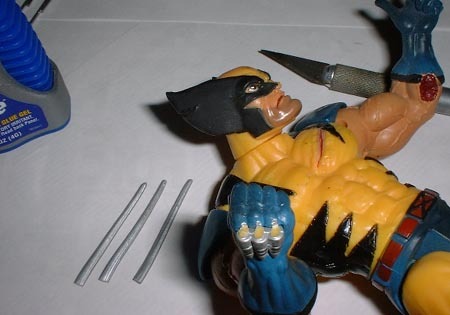 Wolverine's claws have always had a slight curve to them, and it helps them integrate with the figure. I used the pliers to give the new claws just the right arc. Those are both metal claws in the picture, by the way; see how much difference a little bend can make? With all the pre-production finished, you can start assembling. Carefully work the claws into the ports, making sure not to stab yourself in the process - those snipped ends are sharp. In the picture, you can see two of the claws in place. Once you're sure the claw fits, put a drop of glue in the port and push the claw in fully. After doing three sets of these claws, I find that it's easiest to do the two outside claws first, then the center; I use the pliers to hold the claw as I push it in, so that I can get the tightest fit possible. 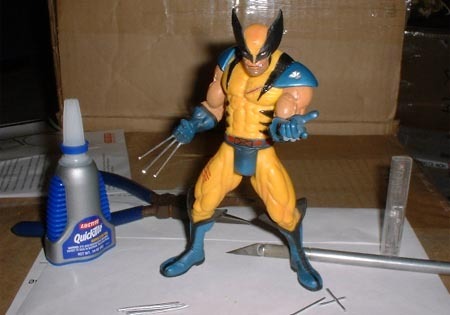 After the claws are in and the glue has set, you're all done: your Wolverine is now customized! I don't suggest sharpening the claws, because you're only likely to hurt yourself with them and the metal looks pretty good even when dull. Someone asked about using one of those triple-bladed disposable razors to provide blades, but I cannot recommend that at all - not only is it incredibly dangerous, but they're the wrong size and shape to properly fit. Stick with the paperclips, for safety and appearance. They're easy and they rock!